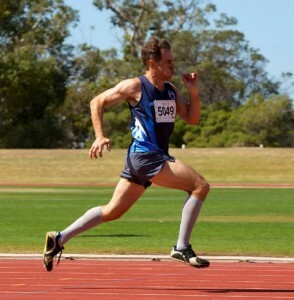 Dean has competed in masters athletics for about ten years after three decades of playing and coaching rugby. Through this time he has found his favourite events to be 200m sprint and 400m hurdles. Now he is also looking to improve in the 100m hurdles and long jump. This year his goal is to compete in the World Masters Championships in Perth. He has attained a Level 2 certificate in coaching sprints. His favourite sprinter is Frankie Fredericks and his favourite motivational theme is “Gonna Fly Now” from Rocky.